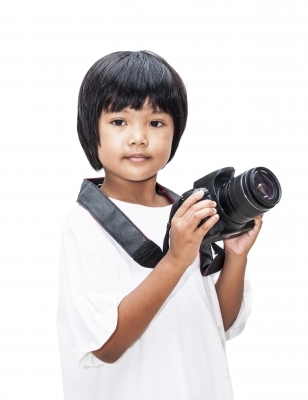 If you notice that your kid has an eye for beauty, then maybe you should consider giving him a taste of photography. Hey, they’re never too young to learn. Taking pictures is all about seeing the beauty in things around us, and introducing your kid to photography opens up an entirely different world for him. For starters, you could lend your kid your trusty old point and shoot, and get him used to the feeling of having it in his hands. Acquaint him with the buttons, flash, and zoom functions. Tell him the importance of handling the camera with care, and that it’s a piece of equipment not akin to his action figures which he can just freely toss around. Remind him to keep his fingers off the lens, and to keep the cap on when not in use. When he’s ready to shoot, you can start with things around the house… food on the table, his sister, his pet dog. Allow him the freedom to choose his subjects, and don’t worry about any rules on photography. Simply let him shoot and see how the pictures turn out. After you’ve loaded the pictures on to the PC from record to disk, just let him marvel at his shots. This will motivate him to learn more complex photography techniques. With the world of photography, he may learn to see things in ways he never has before. This entry was posted in Hobby, Kids, Photography tips and tagged children subject photography, kids and photography, photoblog, photography lesson kids, simple photography subject on December 10, 2015 by Yami.